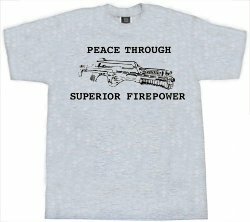 Thanks to a helpful member of the The Aliens Legacy, I finally got the artwork ready for something I've always wanted: a version of the t-shirt Frost wore in Aliens that said "Peace Through Superior Firepower" above and below a drawing of an M41A pulse rifle. 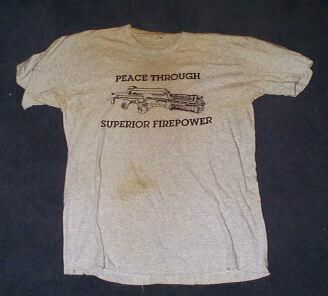 I'm a huge fan of the movie Aliens, and ever since I saw the movie back in 1986, I wanted a copy of that shirt. After following some online dead-ends for sources of such a repro, I realized that the only way to get such a shirt is to make one myself. That probably isn't the best representation of what the final product will look like, but it uses the TIFF I'm going to use to print with, and I tried to keep the scale as close as I could. I can take Visa, Mastercard, etc via PayPal. Use the email address wrhodes@27.org. Shipping is $5.00 for one shirt, and $1.00 for each additional shirt in the order. Domestic orders will be shipped via USPS. International orders will be sent via USPS International Airmail at $9.00 per shirt and $2.50 for each additional shirt. I'm taking orders until Wednesday, September 15th 2004, at which point payments are due. I'm starting the printing on Satureday the 18th. Once I know how many shirts to buy, I'll start shipping the 25th of September. I'll send everyone an email when their shirt(s) ship. I'll be making a couple extra shirts for friends and such, but I won't have many available after 9/15. 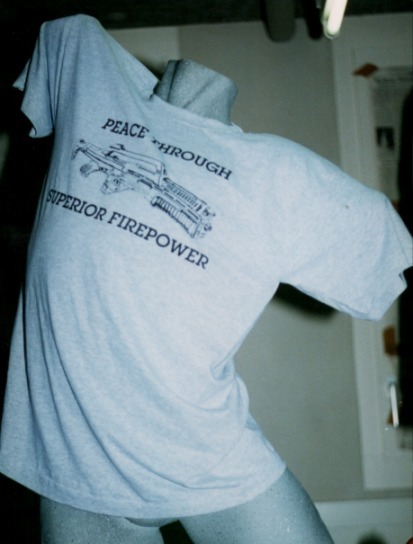 If you've reached this page after 9/15/2004 and want a shirt, send me an email and let me know what you're after. I might still have some extras left over. If you want more than a couple (or you can scrounge a couple friends together who also want a shirt), I'll make a new printing run. If you want less than 24 shirts, then the cost per shirt will be a little higher than what I have above.